In the new school year, everything is shiny and bright. The floors glisten with a fresh coat of wax and the marker bins are full of bright colors. Everything is in its place. By the end of the year, you consider it a win if the first dry-erase marker you try works. Markers get used, pencils break, and paper gets tossed. But one thing that you won’t get a new supply of year after year is calculators. Without proper management, calculators often get lost, marked on, or broken. 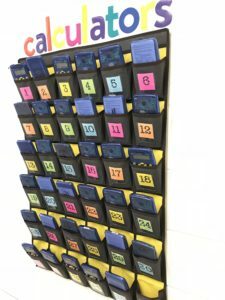 You and your school most likely can’t afford to replace them, so here a few tips to help you still have all of your calculators at the end of the year. Number each calculator. Clearly label each calculator. Permanent marker is best (because who can resist peeling or scratching off a sticker?) You might want to put your name or team name on them too. Have a consistent storage method. Decide where calculators will be stored. It could be their boxes, a calculator caddy or pocket chart, a shoe organizer, or some other location. I use a pocket chart from Amazon that I got for $15. It came with cards, but I printed the numbers on colored paper to brighten it up. Whatever storage method you choose, just make sure it is numbered. Use a sign-up sheet. Make copies of a sign-up sheet (one for each class you have). I usually use colored paper and put them on a clipboard that is accessible to students during class. Have students sign up for a calculator number and tell them that they will use that same number all year long. I let my students pick any number they want because they will remember it better. But if they forget it, they can always look back at the sign-up sheet. Give Expectations. 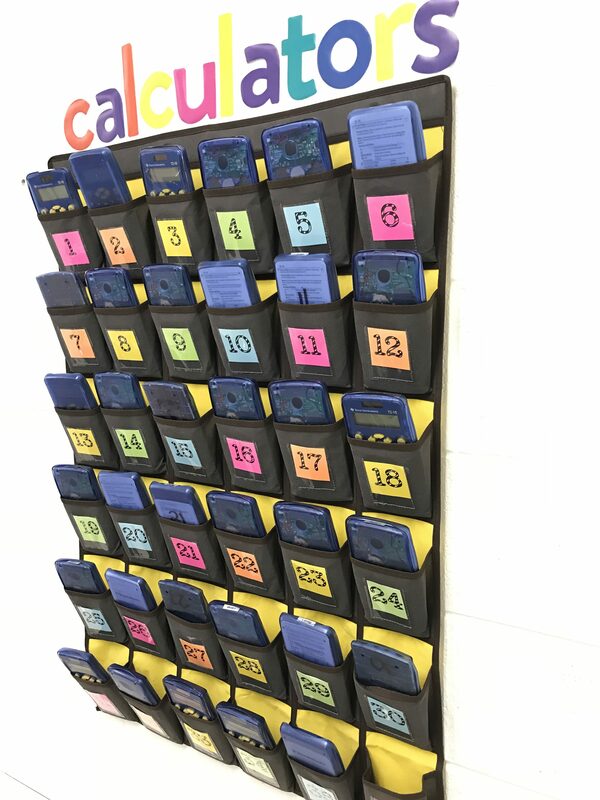 Give students clear expectations about how to get their calculators each class, how to use them, and how to return them. 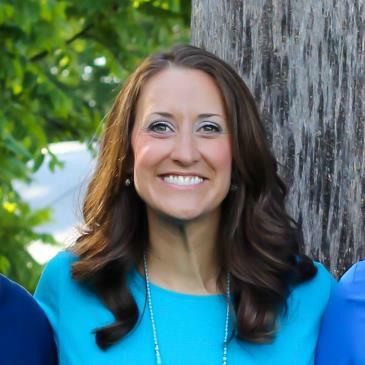 For example, I explain to my students they will take a “one-way street” at the beginning of class and pick them up before going to their seat. I tell them to know where their calculator is at all times so it won’t be knocked off their desk. I make sure they know not to write on it and report to me if it’s missing or something is wrong with it. It is important that they also know to return them in the correct place at the end of every class. I set a silent timer 2 minutes before class ends to make sure they have time to properly put everything away. I ask them to not put up calculators for friends because that’s when they tend to end up in the wrong spot. Whatever you want them to do, tell them! Enforce expectations. Enforce what you say! I don’t let the class leave until every calculator is put back. I remind them of my expectations as needed and they quickly learn that it is just part of our classroom routine. I’m not sure how many times I had to say early on, “We’re still waiting on calculator number…” A little pressure from classmates helps. If something is wrong with a calculator, I track down the student who had it the class before and ask them about it. When students know it is important to you, they will treat materials more respectfully. Bonus Tip: Keep a stash of little alcohol wipes to clean and disinfect your calculators throughout the year. What other tips do you have to share? Leave a comment and let me know! I hope this helps your classroom! 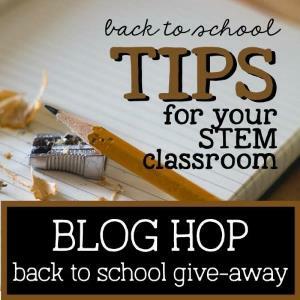 Don’t forget to check out the other Back-to-School tips from our BLOG HOP and enter to win a Vocabulary Word Wall resource from my store!